A reddit thread says that the 128GB variant may cost 1199 Canadian Dollars, which is approximately $900. LG G8 may have a 128GB storage variant and it may cost users approx $900. The phone will reportedly come with Snapdragon 855 processor. It is expected to sport an in-display fingerprint sensor. LG will reportedly launch the G8 ThinQ at MWC this year with a ToF sensor that will reportedly work like Apple’s FaceID. Last month, few images were leaked that gave us an idea about how the phone will look like, however, the information regarding the phone’s hardware is scarce. Now, a Reddit thread has delved out two pieces of information: First, it tells us that the phone could come with a 128GB storage option, and second is the price of the variant. 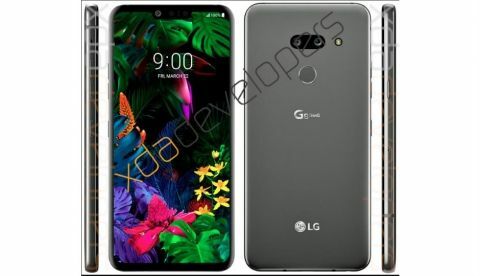 Citing a G8 sku, the Reddit thread says that the LG G8 ThinQ 128GB will cost users a whopping CAD1199 (approx $900). The news builds on the already available information, according to which, the LG G8 ThinQ will have a Qualcomm Snapdragon 855 mobile platform under the hood. Previously leaked renders suggested that the phone will sport dual rear cameras that are horizontally aligned like the LG V40 ThinQ. The renders also showed an LED flash and a fingerprint sensor on the rear of the device, suggesting that there will not be an under-display fingerprint scanner. It has been speculated that the phone could have a 6.1-inch display with an aspect ratio of 19.5:9. The LG G8 may be equipped with ‘sound on display’ technology that would allow it to relay audio through its screen. If the phone has the “Sound on Display” technology, then it is highly expected that the phone could have an OLED panel. The images circulating on the internet shows the phone sporting the volume rocker and the Google Assistant key on the left edge, and a power button on the right side. The LG G8 is unlikely to be a 5G device, which means that it will not sport Qualcomm’s X50 modem with the Snapdragon 855. This could be due to because LG may introduce 5G capabilities in LG V50 ThinQ, which may also launch alongside the LG G8 ThinQ. It is speculated that the phone will have a 6-inch display, a 4000mAh battery, and is expected to launch in North America and Europe first, for a suggested retail price of $1163. Can i get may edition this month?